To broadly circulate the results of the Helike Project work, the Helike Society has organized three International Conferences entitled Ancient Helike and Aigialeia and has published the Proceedings volumes. The results of the work carried out by the Helike Project from the time it began in 1988 until 1995 were presented in the 1995 International Conference (Helike II) and the results of the work conducted between 1995 and 2000 in the 2000 International Conference (Helike III) respectively. 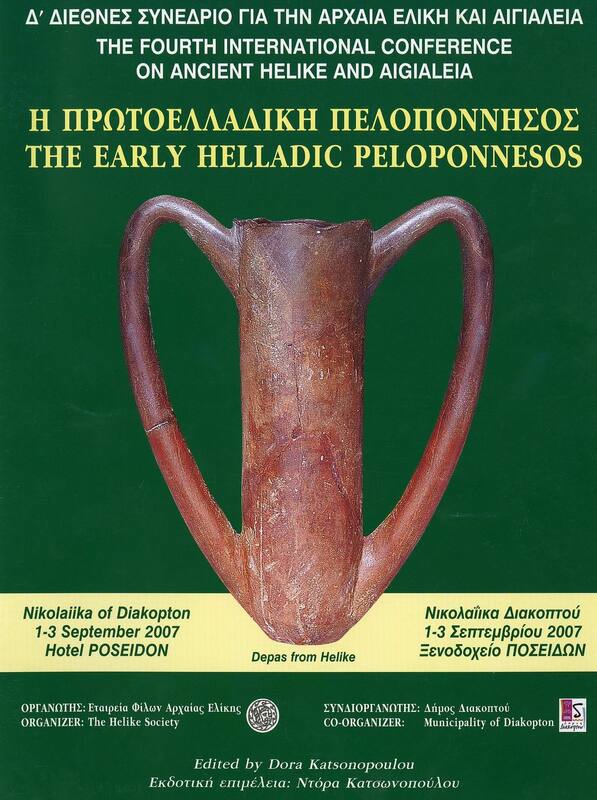 The Proceedings volume of the 1995 Conference, entitled Ancient Helike and Aigialeia, Helike II, edited by D. Katsonopoulou, S. Soter and D. Schilardi, was published in 1998. 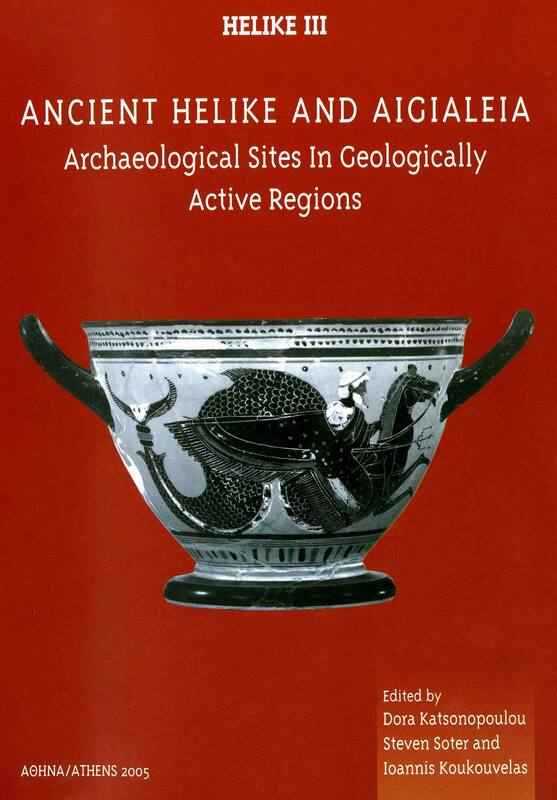 The Proceedings volume of the 2000 Conference, entitled Ancient Helike and Aigialeia Archaeological Sites in Geologically Active Regions, Helike III, edited by D. Katsonopoulou, S. Soter and I. Koukouvelas was published in 2005. To present the finds from the unique Early Helladic settlement at Helike, discovered by the Helike Project in the plain of Helike in recent years, the Helike Society organized in 2007 the Fourth International Conference dedicated to the Early Helladic Peloponnesos. The Proceedings volume of the 2007 Conference, entitled Ancient Helike and Aigialeia, Helike IV, edited by D. Katsonopoulou, is now in press. 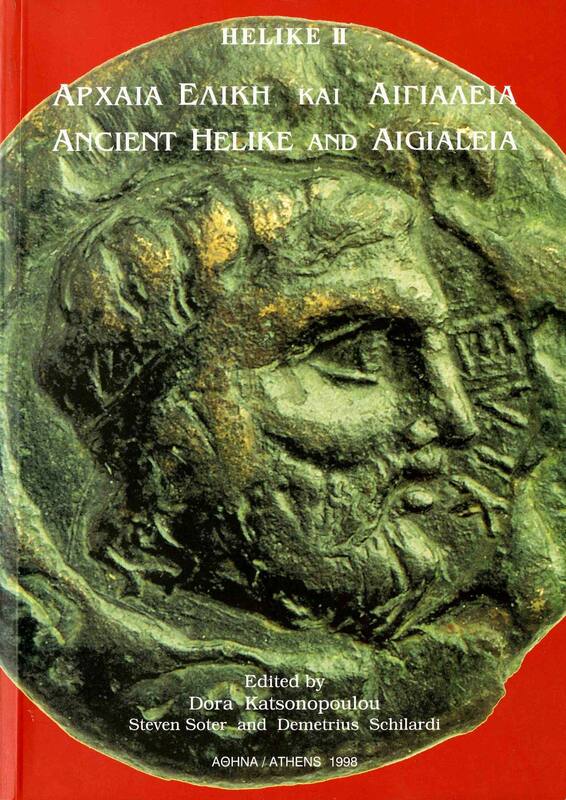 The Helike II volume entitled Ancient Helike and Aigialeia includes papers presented during the Second International Conference on Ancient Helike and Aigialeia, organized by the Helike Society and the Municipality of Aigion and held in Aigion from 1-3 December 1995. At this Conference were presented the results of the Helike Project work in the area of Helike between 1988 and 1995. The Helike II volume includes 28 scientific papers listed under three entities. Part I entitled The Helike Project. Work and Results: 1988-1995 includes 8 papers dealing exclusively with the scientific research carried out by the Helike Project and collaborators in the first phase of the work between 1988 and 1995. First, the new data on the topography of the Helike area are discussed (Katsonopoulou). The new picture emerging from the underwater sonar survey, the bore hole drilling and geophysical exploration in the Helike plain are presented in a synthetic paper (Soter and Katsonopoulou) as well as the results of the first excavations in the area (Katsonopoulou). The significant results of geophysical research in the Helike plain (Papamarinopoulos et al.) and the nearby hills (Soter and Katsonopoulou) are presented in combination with the data of radio-carbon (Maniatis et al.) and opto-luminescence dating (Lyritzis and Galloway). Finally geochemical analysis of samples from Helike are discussed (Varnavas). Part II entitled Aigialeia and the Colonies of Helike includes 14 papers focusing on the region of Aigialeia and colonization in South Italy and Spain . First, latest research in the area of the neighboring city of Aigeira east from Helike is presented (Bammer). The reasons of Helike’s disappearance both physically and politically are examined next (Faraklas) and a different approach to the location of Helike is offered (Kourakis). The cult of Helikonios Poseidon under a new perspective (Katsonopoulou) and in a more general context in Peloponnesos (Schilardi) as well as its connections with Ionia (Schilardi) are discussed and analyzed. The following papers deal with the Achaean colonization in the West (Coldstream, Greco), particularly Sybaris (Guzzo, Luppino), the coinage (Stazio) and geological research (Cotecchia and Pagliarulo). The last two papers of part II present research data regarding connections of Greek Helike with the Iberian one (Fernandez) and the Hellenization of Iberia (Espinosa). Part III entitled Geology of the Aigialeia Region and the Helike Delta includes 6 papers on catastrophic events in the area of Helike (Postma), liquefaction (Sotiropoulos), marine geology (Lykoussis et al.) and seabed pockmarks (Hovland). The last two papers deal with the 373 BC Helike earthquake (Papadopoulos) and the most recent 1995 Aigion earthquake regarding macroscopic anomalies (Soter). The Helike III volume entitled Ancient Helike and Aigialeia, Archaeological Sites in Geologically Active Regions includes the papers presented during the Third International Conference on Ancient Helike and Aigialeia, organized by the Helike Society and the Municipality of Diakopton and held in Nikolaiika of Diakopton from 6-9 October 2000. The specific aims of the Conference were to present (a) the results of the multi-disciplinary work of the Helike Project in the Helike area between 1996 and 2000 (b) other geological and paleoseismological studies carried out in the major area of Helike and (c) scientific work from other geologically active sites of the ancient Greek world such as Ephesos in Asia Minor and Lokris in Central Greece. The Helike III volume includes 19 scientific papers listed under two entities. Part I entitled Archaeology and Topography, includes 9 papers dealing with archaeological and topographical studies of Helike and the areas of Ephesos and Lokris. For the first time, archaeological evidence from the Helike area possibly associated with the earthquake of 373 BC is presented and all available literary evidence on the major catastrophic event is analyzed (Katsonopoulou). The archaeological finds from the first excavations carried out in the Helike plain in 2000, covering a broad chronological range from the Early Helladic to the Late Byzantine times, are presented and discussed (Katsonopoulou). A reconstruction of the Helike landscape in the Venetian period is attempted on the basis of cartographic analysis and study of other Venetian documents including the inland site of Mamousia (Wagstaff, Chrysochoou), the area of Diakopton and Vostizza (Chrysochoou). The interesting landscape similarities between Helike and Ephesos are examined (Bammer) and the cult relations of Ephesos with the Ionian migration originated from Helike are presented (Muss). Finally, new evidence on destruction of ancient monuments in Lokris as a result of earthquakes is presented (Dakoronia). Part II entitled Geoarchaeology and Geomorphology, includes 10 papers focusing on geological, geophysical and geomorphological studies conducted in the major Helike area, the neighboring region of Aigion and the area of Lokris across the Corinthian Gulf . First, the results of the combined geoarchaeological work of the Helike Project in the Helike Delta between 1991 and 2000 are discussed (Soter and Katsonopoulou) and microfaunal evidence from the Helike Delta is presented (Alvarez-Zarikian et al.). The location of the lost Helike site is proposed on the basis of gravity evidence from the plain (Dimitropoulos and Noutsis) and geological scenarios of the disappearance of Helike following the 373 BC earthquake are presented (Ferentinos and Papatheodorou). The interesting results of paleoseismological trenching in the Helike area regarding the Kerynites river course (Koukouvelas et al.) and the history of the eastern Helike Fault (McNeil et al.) are presented and discussed. Finally, is discussed geological evidence regarding the paleogeography and geoarchaeology of neighboring regions such as Aigion (Maroukian et al. ), the Aliki lagoon (Kontopoulos and Avramidis) and Ano Diakopton (Trikolas and Kourtesi). The last paper of Part II refers to geophysical results of a magnetic survey carried out at the Bronze Age site of Mitrou in Lokris (Soter et al.). The Helike IV abstracts volume entitled The Early Helladic Peloponnesos includes the abstracts of 25 papers presented during the Fourth International Conference on Ancient Helike and Aigialeia, organized by the Helike Society and the Municipality of Diakopton and held in Nikolaiika of Diakopton from 1-3 September 2007. The specific aims of the Conference were to present (a) the results of the excavations and preliminary studies of the rich finds from the newly discovered Early Helladic settlement at Helike (b) most recent excavation results from other Early Helladic settlements of Peloponnesos and (c) geological and environmental evidence from Early Helladic sites. The possibility that the beginning of the Bronze Age in Greece was linked to broader events in SE Europe and NW Anatolia is explored by John Coleman and a review of radiocarbon dates from Early Helladic sites toward the establishment of an absolute chronology of the prehistoric Aegean is offered by Yorgos Facorellis. Recent work in the Sparta Basin is presented by Christopher Mee et al., on monumental buildings from Akovitika by Petros Themelis and on Early Helladic burial mounds from Thebes by Vassilis Aravantinos and Kyriaki Psaraki. The excavation results and general conclusions on the Early Helladic proto-urban settlement at Helike are described by Dora Katsonopoulou and first studies on the EH finds are presented by the Helike Project associates: pottery by Stella Katsarou, lithics by Nicholas Thompson, malacological material by Lilian Karali, animal bones by Melanie Fillios. The distribution of settlement in Early Helladic I at the Corinthian Gulf is examined by Eva Alram Stern and Erika Weiberg studies connections between topography and settlement in the EH period. Early Helladic III phases in Aigina Kolonna are described by Walter Gauss and Early Helladic II pottery by Lydia Berger. The Early Helladic shipwreck off the Dokos island and the pottery types of its cargo are analyzed by Giorgos Papathanassopoulos while Giorgos Papatheodorou et al. present the geomorphology of the shipwreck area. Eleni Konsolaki describes and analyzes the Early Helladic habitation on the island of Poros and Martha Wiencke presents new thoughts on the Lerna sealings. Natural environment in EH cultural change of the Argive plain is the subject of the paper by Christine Shriner et al., environmental changes in the SW Peloponnesos are examined by Helmut Brueckner et al. and in NW Peloponnesos by Asimakis Koutsios and Nikolaos Kontopoulos. Active tectonics in the Helike area is presented by Ioannis Koukouvelas and recent geological studies in the same area are examined by Kostas Trikolas. The geoenvironmental evolution of Helike and her colony Sybaris are studied by Franco Ortolani and Silvana Pagliuca. An overview of palaeoearthquakes and palaeotsunamis in the Gulf of Corinth is offered by Gerassimos Papadopoulos. The new volume Helike IV was recently published by the Helike Society, edited by the Society President Prof. Dora Katsonopoulou. 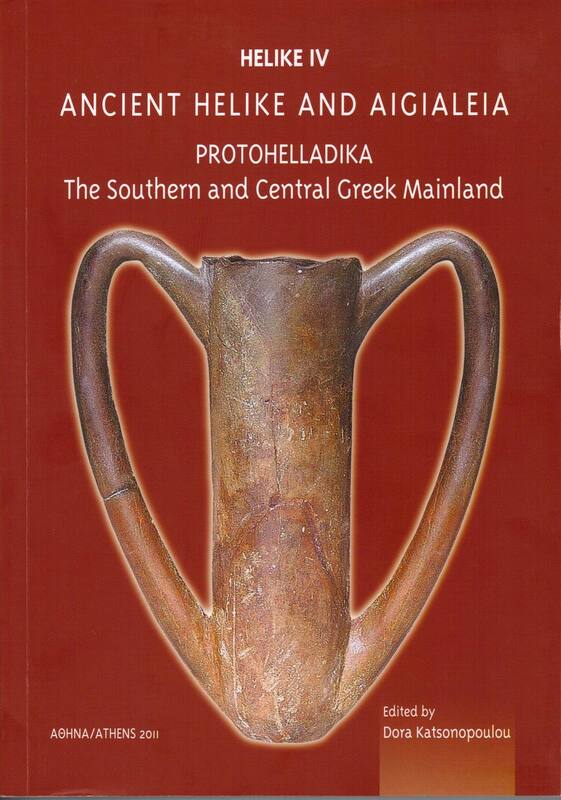 In the new volume, under the specific title PROTOHELLADIKA- The Southern and Central Greek Mainland, are included 18 papers of well known Greek and foreign scholars regarding results of studies and research in Ancient Helike and other Early Helladic sites of the southern and central Greece. In the first paper of the volume, an important issue of the Greek prehistory is discussed, namely the beginning of the Early Bronze Age in Greece and its possible connection with broader migration movements of Indo-European speakers in SE Europe and NW Anatolia (J. Coleman). Then, the role of local topography in supplying boundaries for EH settlements is examined, using examples from the Peloponnese and central Greece (Ε. Weiberg). The next group of papers refers to the recent discovery of a proto-urban EH II-III settlement in the area of Helike in Achaea . First, a synthesis of all finds from the excavations carried out between 2000-2007 is presented suggesting a high level of urbanization for the settlement which seems to have functioned as a central coastal settlement in the area of eastern Achaea in the third millennium BC (D. Katsonopoulou). Next, the rich in quantity and quality pottery is presented, its morphology is analyzed and its use and distribution inside the settlement is discussed (St. Katsarou-Tzeveleki). The study of the pottery is further illustrated by the presentation of the first results of petrographic assessment of houseware and storage pithoi from the settlement (I. Iliopoulos et al.). The products of a small scale flake industry in EH Helike relying primarily on local sources of raw material are presented (N. Thompson) and important data on dietary habits and specific activities of the settlement are discussed based on studies of representative assemblages from malacological (L. Karali) and faunal remains (M. Fillios). Lastly, environmental changes in the area of the EH settlement are discussed based on geoarchaeological research of the Helike Delta (A. Koutsios and N. Kontopoulos). In the next session, the EH I period is examined in the area around the eastern Corinthian Gulf focusing on the EH I site of Aigeira in Achaea (E. Alram-Stern). New evidence from the neighboring Derveni in Korinthia suggests the existence of an EH II coastal settlement continuously inhabited from early to late EH II period (Δ. Σαρρή). The impressive sealings from Lerna are re-examined in the light of new ideas (M. Wiencke), while sea rise and climatic changes are suggested as the factors of Early Helladic cultural change on the Argive plain (C. Shriner et al.). The late EH II pottery from the site of Kolonna on Aegina is analyzed next (L. Berger). The recently found EH sites on the island of Poros are also presented and discussed (Ελ. Κονσολάκη-Γιαννοπούλου). In the last part of the volume, are discussed monumental buildings of the Early Helladic period such as the EH burial mounds of Thebes (Βασ. Αραβαντινός και Κ. Ψαράκη), and corridor houses discovered in the southern and central Greece (Π. Θέμελης). Based on the results of geoarchaeological work in Akovitika of Messenia, the relationship between environmental changes and desertion of sites is examined (M. Engel et al.). The volume Helike IV as well as volumes II and III can be ordered at Mrs. Maria Karvela (Secretary General of the Helike Society) and/or at www.andromedabooks.gr . The new volume Helike V was recently published by the Helike Society, edited by the Society President Prof. Dora Katsonopoulou. The volume is the fifth in the series of Proceedings of International Conferences on Ancient Helike and Aigialeia, organized by the Helike Society and held in the region of Aigialeia about every five years. 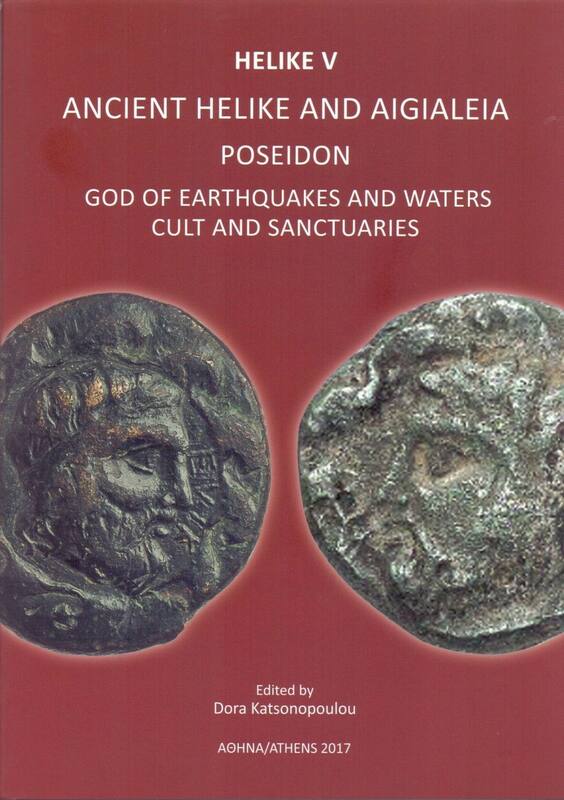 In the new volume, under the specific title POSEIDON, God of Earthquakes and Waters. Cult and Sanctuaries are included 16 scholarly papers presented during the Fifth International Conference on Ancient Helike and Aigialeia, which took place in Aigion from 4-6 October, 2013. Main purpose of the Conference was to present (a) the most recent data on Poseidon’s cult in the Helike region and other areas of the Peloponnese, and Ionia in Asia Minor where the god was strongly worshipped as Helikonios and (b) seismic phenomena, and especially the 373 BC earthquake in connection with Poseidon’s primordial capacity as god of earthquakes and waters. The 16 papers of the volume are divided into two parts. Part I, entitled Cult and Sanctuaries of Poseidon, includes nine studies on Poseidon’s cult in Helike and other areas of the Peloponnese, also in Ionia of Asia Minor. Part II, entitled Poseidon and Earthquakes: Helike and the Gulf of Corinth, contains seven papers on the area of Ancient Helike and the seismic history of the Gulf of Corinth, focusing on the remarkable 373 BC earthquake and its impact. Part I begins with the presentation of new elements about the cult of Poseidon Helikonios in Helike based on available literary evidence and the new archaeological data from excavation work of the Helike Project in the area (Dora Katsonopoulou). Next, the metrological and iconographic contexts of all the known Helike coins are for the first time examined and it is concluded that they were part of a small, one-time issue sometime around 300 BC (Robert Weir). The next three articles of the volume by Hans Lohmann, Hans Lohmann and Özge Özgul, and Frank Hulek about Panionion, the central sanctuary of the Ionian League in Asia Minor, where Poseidon was worshipped as Helikonios, present the latest evidence on its location from archaeological excavations and geoarchaeological research conducted at Mt. Çatallar Tepe in the Mykale region. The meaning of the Homeric epithets and titles of Poseidon enossigaios, enosichthon, and gaieochos is explored next by IoannisPetropoulos, and Poseidon’s special connection with the Peloponnese and his cult in the early historic times is analysed by Ελένη Μαράντου. The beginning and the development of Poseidon’s cult in Troezenia are presented in detail in the following study by Eleni Konsolaki Yannopoulou, and the sanctuary of Poseidon Gaieochos in Mikri Dragonara of the island of Kythera is next described by Άρης Τσαραβόπουλος and Γκέλη Φράγκου. Part II begins with the presentation of the results of geophysical prospection at the Mycenaean cemetery in the area of Ancient Helike (Grigoris Tsokas et al.) and of petrographic and geochemical analyses of pottery from the Early Helladic Helike settlement (Ioannis Iliopoulos and Vayia Xanthopoulou). A different approach is next presented regarding the possible causes of Helike’s natural destruction in 373 BC in conjunction with terrestrial flooding as a medium of catastrophe (Nikolaos Kontopoulos, Dora Katsonopoulou and Asimakis Koutsios) while similar conclusions are reached via the geological study of the area by Κωνσταντίνος Τρίκολας. The 373 BC catastrophe and its impact at the site of Delphi are investigated next via a new ‘reading’ of the architecture of the sanctuary as a whole by Elena Partida. The last papers of the volume refer to the eastern part of the Gulf of Corinth. Initially, the palaeoseismological history of the Kenchreai Fault in Korinthia is re-considered by Ioannis Koukouvelas and Elena Korka, and next, the geological history of the ports of Lechaion and Kenchreai after the late Roman period is presented by Νίκος Μουρτζάς and Ελένη Κολαΐτη. 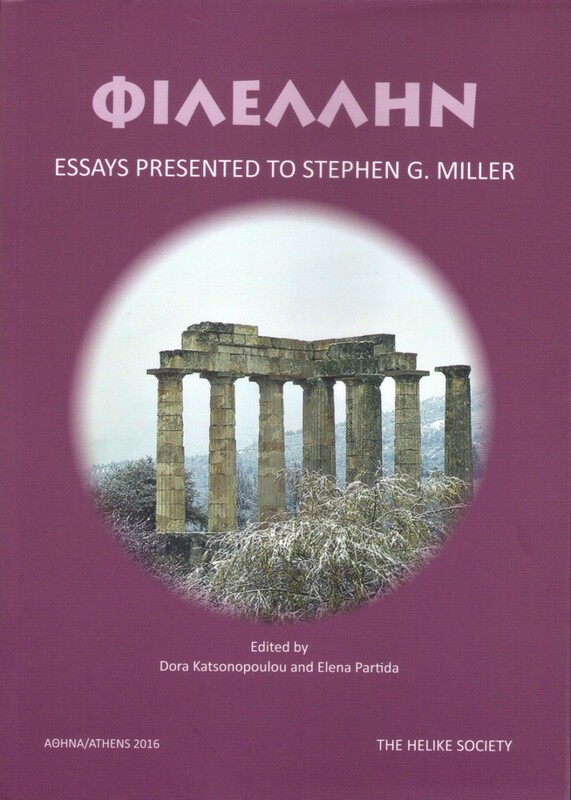 The volume dedicated to Stephen Miller, and edited by Dora Katsonopoulou and Elena Partida, includes twenty-five scholarly papers dealing with a variety of topics to reflect as many as possible of the dedicatee’s own interests in architecture, athletics, sculpture, history, epigraphy, numismatics, ethnography, philosophy, and, of course, Nemea. In the first paper of the volume, a different approach to coinage and its meaning is attempted by Frank Holt who examines the coins as if they could themselves affect their own evolution. Turning to numismatic evidence from the neighbours of Nemea, Sikyon and Corinth, the volume hosts the first publication by Robert Weir of the 107 coins found in the first twenty years of survey and excavation in the area of ancient Helike in Achaea. Next, contributions pass on to monumental athletic installations and how the ancient stadion lent its name to the competition of foot-racing and also to the venue where foot-races were held. In particular, Barbara Rieger-Dimde reviews the change, over time, in the appearance and the infrastructure of these installations and discusses functional changes in stadia from venues for gymnastic competitions to staging gladiatorial combats. Data concerning the Olympic Games that were held in Macedonia are, then, analyzed by Evangelos Albanidis revealing that actually two Olympic Games were held in Northern Greece, one at Dion, and another in Beroia. The prominence of athletics and equestrian sport in the life of our ancestors is clearly demonstrated in Xenophon’s dialogue, Hiero, as analyzed by Thomas Heine Nielsen. The longevity of the Games is reflected on a cameo of 1250 AD, today in the Kunsthistorischen Museum of Vienna, associated by Ingomar Weiler with the ancient Isthmia. Next, Istvan Kertesz, focuses on standards of fair play as safeguarded by the organizers of the ancient Olympic Games, and the punishment of sportsmen who violated these standards. Comparatively less known are the maritime contests, incorporated in religious festivals of ancient Athens, a topic discussed by Athena Trakadas in her contribution. Tracing the origins of the modern Marathon race, Thomas Scanlon next unfolds the ancient parallels between warfare and. A herm depicting the philosopher Plato with the victory fillets of an athlete is discussed by Heather Reid who supports Miller’s argument philosophically, showing how gymnastics functioned in Plato’s theory of moral education. Next, the marble head of a young athlete, today in the Chrysler Museum in Norfolk, is presented and discussed by Hans Rupprecht Goette, and in the following paper the fragment of an attic sarcophagus, today in the Athens National Museum is discussed by Stelios Katakis, who suggests that the relief depicts a scene of the Kentauromachy. A number of marble statues made by the renowned Parian sculptor Skopas of the 4th century BC for the cities of Sikyon and Argos in the Peloponnese, are discussed in the next contribution by Dora Katsonopoulou, in the light of reviewed literary and archaeological evidence, and in connection to Skopas’ long and prolific career. Following the quest on another work of the same Parian master, Angelos Delivorrias in his paper explores the possibility for some statue types of Eros to actually represent Phaethon accompanying together with Pothos the cult statue of Aphrodite for her temple in Samothrace. Next another ancient figure, this time a mortal historical person, namely Aristis, son of Pheidon of Kleonai, winner of four victories in the pancration at the Nemean Games is presented by Emmanuel Voutiras. The region of Nemea itself is revisited by Charalambos Kritzas, in his paper, on account of three brief epigraphic testimonies from Nemea, proposing new readings and interpretation. Continuing on Nemea, Jeannette Marchand offers an explanation for the supposedly problematic placement of Nemea on a map of Roman roads in Greece, known as the Peutinger table. The temple of Nemean Zeus at the end of the 17th century, as seen by a Venetian official, is next presented by Kostas Tsiknakis who also comments on the circumstances of that visit. Moving on to the field of architecture, Elena Partida evaluates what the ancient builders learnt from natural catastrophes brought upon religious edifices, focusing on the sanctuary at Olympia and the repercussions of the Helike catastrophic earthquake in 373 BC. Remaining in the field, the direct links between Etruria and Macedonia are noted by Vincent Jolivet on account of architectural elements observed on the Etruscan tomb of Grotte Scalina dating to the late 4th century BC. Turning then to Vergina, the large burial monument with an Ionic façade, probably of a military man, presented by Stella Drougou, adds to our knowledge of Macedonian tombs of this type, known from a few examples so far. Staying in the field of sepulchral architecture, Yannis Lolos discusses a Roman mausoleum dated to the 1st century AD, located in the heart of the modern town of Patras. The next paper, by Pantos Pantos, takes us to the beginning of the 20th century and the adversities encountered in those early times, when archaeology was not yet a fully-fledged faculty, via a presentation of archival reports on the excavations conducted by Nikolaos Pappadakis at the site of the Pyre of Herakles on Mt Oeta. From archival records, we turn to iconography and the symbolism behind devices on ancient Greek diskoi, interpreted by Wendy Raschke. Also metaphorical is probably the inscription on a fragment of a Laconian pan-tile found in the Athenian Agora, thought to announce the victory of a man named Δόλιχος in a game related with stones, and now re-interpreted by Panos Valavanis.